This friendship is all about endless possibilities because they’re compatible and in love with what life has to offer them. The Aries and the Sagittarius make very good friends because they complete each other. The first simply loves how the second is honest, friendly and open-minded, while the Archer adores the fact that the Ram is enthusiastic, bold and straightforward. Both these natives enjoy sports, so it’s possible they’ll spend together a lot of time in the gym or doing something outdoors because they both want to release their energy and need to be active. Of course, the Aries will get mad when the Sagittarius won’t have enough time for him or her because people in this sign are always doing something and changing their plans. In return, the Archer will be annoyed when the Ram is too stubborn and wants to do things only his or her way. However, these two can have great fun together because their friendship is honest and simply charming. Neither of them hesitates to use humor in the most difficult situations. They won’t mind making fun of each other, so their friendship is based on laughter and usually meant to last. Both can come up with great ideas of spending their time and incredible jokes, especially when the times seem very difficult. It’s not impossible to find them competing in pie-eating contests or doing the portrait of one another in a painting class. One thing is for sure with these two: they can never get bored when together because they’re both attracted to new challenges and want their lives to be as enjoyable as possible. The friendship between them is all about endless possibilities because they’re compatible and in love with excitement. Therefore, the Aries and the Sagittarius will be happy to have found each other and to pursue new things together, as friends. Astrology describes them both as pioneers of life and explorers of new territories. However, they need to be careful not to get into accidents as they’re too dynamic and usually can’t sit still for a moment. For example, the Aries is impulsive and doesn’t think twice before taking risks. The Sagittarius doesn’t have the same problem, but only sees the big picture, which means he or she can miss on important details that are sometimes essential for safety. The energetic Aries will always be intrigued by the exploring Sagittarius. They’re both Fire signs, so they love to just move around and to party, regardless of the situation. The Aries is very curious about the new, whereas the Sagittarius believes in honor and traditions. This is another reason why their friendship is complementary as they have different tastes. The Aries will always be happy to have fun with the Sagittarius, the Sagittarius can’t resist the enthusiasm of an Aries. It’s like when these two are together, everything is possible. They make great friends because they can understand each other and both have an optimism that can never be destroyed. However, it’s possible the Sagittarius feels dominated by the Aries because the latter is pretty bossy. Furthermore, the Ram has a higher sensitivity when compared to the Archer, so this last mentioned one should be careful not to make harsh remarks. However, regardless of how many problems they have as friends, they can immediately forgive each other and forget why they’ve started arguing, not to mention neither of them is known to hold grudges. The Aries is ruled by the planet Mars, while the Sagittarius by Jupiter. Both these planets’ energies are masculine and work in the same ways. Mars is very much about taking initiative, whereas Jupiter inspires tolerance and big dreams. Having great energy and never being tired, the Aries and the Sagittarius can inspire one another to take part in different activities and to easily overcome difficulties. Being a cardinal sign, the Aries comes up with new plans and has many ideas. As a mutable sign, the Sagittarius doesn’t mind following what the Aries has said and usually gets involved in anything. The Sagittarius will never be upset running things from the shadows and allowing the Aries to be in the center of attention. Both of them are good at taking the initiative, and the Aries is known to be more changeable, whereas the Sagittarius usually finishes what he or she has started. These two have quick tempers and don’t know how to deal with arguments in a calm way. Therefore, when fighting, they’ll scream and even throw things around. They should realize backing down a little bit in a conflict can only bring them good. Very energetic and smart, they can agree on many things and both have intellectual pursuits. Expect them to be those colleagues who are doing together something very creative and interesting. If things aren’t going in this direction and they’re not working together, they’d probably be heading off for a new adventure as best friends. As a matter of fact, both would do anything just to never get bored. When it comes to money, neither of these two knows how to put something aside, so it’s possible for them to spend everything in their wallets at a nightclub and to have nothing for food the next day. They tend to not care about finances when fun is about to follow. 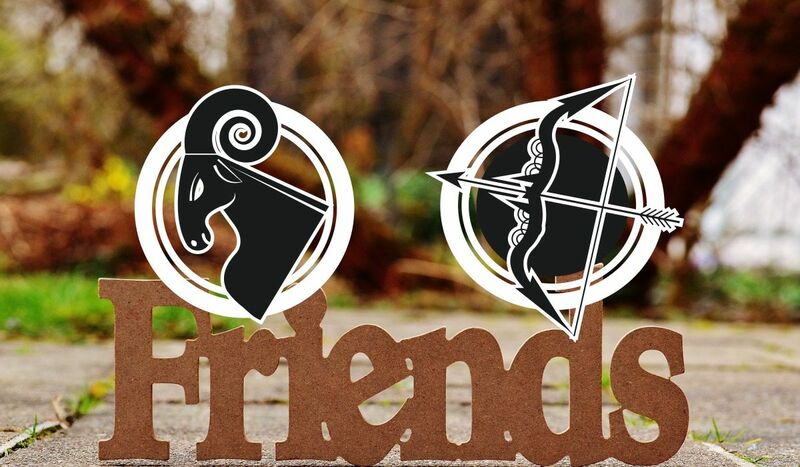 The best thing about the friendship between the Ram and the Archer is their compatibility when it comes to their energy levels and the adventures they’re both ready to take on. These two signs have too many things in common to not be great friends. The Aries loves to go out and is often used as a wing person because he or she has good opinions about dating and doesn’t hesitate to speak the truth. Furthermore, the Ram can smell trouble even way ahead of time. Very loyal as a friend, he or she can be accused of being a little bit selfish and even for neglecting his or her loved ones. However, when it comes to offering help and doing what he or she has promised, there’s no one better than the person in this sign. It’s true Arieses are a little bit unusual because they’re very independent, but their loyalty can’t be matched and remain unappreciated. There will be people who judge them too fast and in a superficial way, but these individuals’ opinion will surely change with time. The Aries is great at parties because he or she loves to socialize and doesn’t mind bringing the shyest people into the center of attention. Others simply love the Aries for being fun and for wanting to go out as much as possible. His or her friends will be from all circles of life because people in this sign love to interact with anyone and want variety. It’s possible for them to have many marriages, but this won’t make their friends be less interested in spending time with them. Having so many energetic influences from the sky, natives of this sign are always full of life and enjoy friendships that are exciting to the extreme. Any challenge makes them thrive, so they don’t hesitate to take part in competitions and to argue or even to physically fight, regardless if the conflict is friendly or serious. Those who want someone to stimulate them and to help their life become more dynamic should choose an Aries as their best friend. Furthermore, the Ram can help anyone become better because he or she sees only the best in people. This is a sign full of charisma and who needs someone very dynamic to handle him or her. Very extroverted and full of creativity, the Aries can make any project look more interesting. The Sagittarius makes friends very fast, but the fact that he or she is very charismatic is sometimes confused with superficiality. However, people should know Sagittarians are in fact very sensitive, even if they sometimes forget to tell their loved ones how important they are to them. Many will see them as a little bit uninteresting as friends because they can’t talk about feelings. It can be hard for someone who’s close to Sagittarius to tell if their Archer friend is truly interested in developing the connection further or not. However, people in this sign are very generous and love seeing what’s best in people. Furthermore, they’re never cynical and usually have a good grasp on reality, in the sense that they’re never promising others what they can’t do. All Sagittarians love going to parties and making new friends, but they’re also obsessed with discovering the absolute truth and living a meaningful life. Interested only in adventure, it can be difficult to tie them down or to make them commit, but as long as someone is ready to take on new challenges and to share this, they become more than happy to be that person’s best friend. It’s smart to never tell a Sagittarius what to do because Archers hate having responsibilities and don’t want others to expect things of them. Loving any physical competition and a good intellectual debate, they like smart individuals who can talk about anything. However, their loved ones should be aware of the fact that the Archer is very direct, honest and very hurtful when making harsh remarks.